COMBAT DRY SKIN WITH DERMA HYDRATE! Most bar soaps dry out the skin and if you suffer from dry skin or if you have eczema (also known as atopic dermatitis), your skin may be particularly red, dry, itchy, and flaky—so finding a good soap that moisturizes the skin is extra important. Most times people with these conditions would opt for liquid cleansers as they they are said to cause less damage than bar soaps but that is over now. 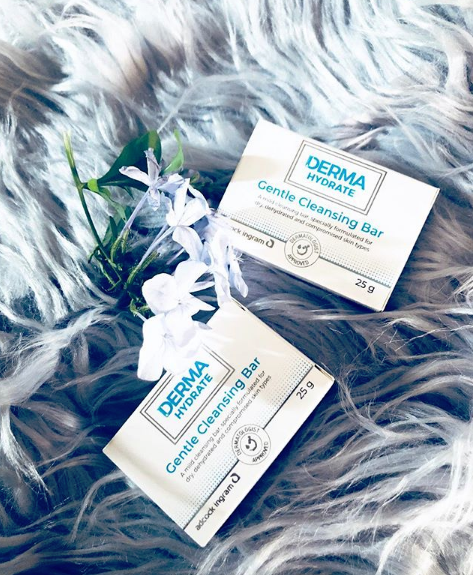 Derma Hydrate has introduced the new cleansing bar that is said to be soap free and formulated for dry, dehydrated and compromised skin types. My experience with using this bar was actually quite pleasant because it added moisture to my skin unlike my regular soap that I use from head to toe. There are degrees of dryness and they all mean different things about your skin. - Dry skin can be caused by extreme weather conditions and temperature changes (cold, wet, and windy weather; strong sunlight; central heating). - Dry skin is also caused by frequent washing with soap or detergents, contact with strong household chemicals and cleansers. - Genetic predisposition to skin disorders such as psoriasis and atopic eczema. Dry skin is a taut, rough and itchy condition caused by excessive water loss in the skin. It is caused by a reduction in the barrier properties of the skin, producing an increase in TEWL (Transepidermal Water Loss). This condition is exacerbated by cold, dry environmental conditions and age, due to epidermal thinning and lipid attrition. Small reduction in water content (10 – 20%) can result in a dry, cracked brittle epidermis, susceptible to attack by bacteria and allergens.